Concerns about the infection rate of central line catheters in their ICU population were identified. It was noted that there was varied application of the standards of care resulting in a higher than acceptable rate of CLABSI The authors decided there needed to be deliberate training to develop a more competent skilled workforce. Cohen, E.R., Feinglass, J., Barsuk, J. H., Barnard, C., O’Donnell, A., McGaghie, W. C., & Wayne, D.B. Savings (2010). From reduced catheter-related bloodstream infection after simulation-based education for residents in a medical intensive care unit. 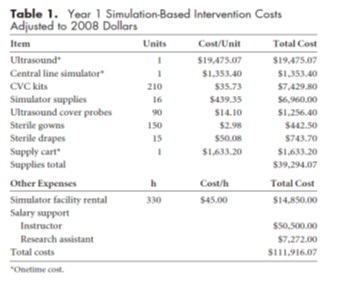 Simulation in Healthcare 5:98-102. 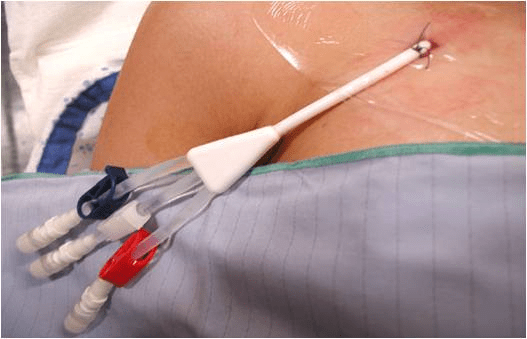 Patient care bundles that incorporate evidence-based guidelines to ensure strict adherence to sterile technique during CVC insertion can reduce rates of central line associated bloodstream infections (CLABSI) (6.8). There is evidence that implementing a simulation based mastery learning program in CVC insertion reduced CLASBI rates as compared to conventional hospital infection control efforts such as a patient care bundles. The authors implemented a simulation-based mastery learning program in CVC insertion skills with medicine and emergency medicine residents. Rates of CLABSI from CVCs inserted by residents in the ICU before and after the simulation based educational intervention were compared over a 32-month period. The reduction of infection was sustained for 16 months after the intervention. After the simulator-trained residents entered the intervention ICU (0.50 infections per 1000 catheter-days) compared with both the same unit prior to the intervention (3.20 per 1000 catheter-days) (p=.001) and with another ICU in the same hospital throughout the study period (5.03 per 1000 catheter-days) (p=.001) there were fewer CLABSI. Before the simulation-based intervention, the average infection rate was 4.2/100 MICU CVC admissions (11 infections in 239 CVC patients). After the intervention, the rate was reduced to 0.42/100 admissions (one infection in 238 CVC patients), thus preventing an estimated 9.95 CRBSI cases in the year after the intervention. One approach relies on estimating the attributable cost of adverse events directly from a risk-adjusted regression analysis of costs, using the coefficient on adverse event incidence in the regression model to estimate the additional costs associated with each adverse event prevented. The additional costs and additional hospital days associated with CLABSI infection were calculated. More sophisticated propensity and risk adjusted calculations are feasible (See the reference for details), but for the purpose of this toolkit we are using a simpler approach.